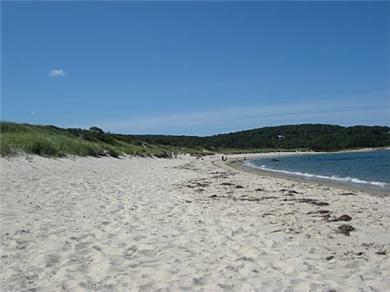 West Tisbury covers 34 square miles and has a year-round population of about 2,600. This number grows to several times that in the summer. The first recorded settlement was in 1669; it was incorporated as a town in 1892, when the settlement of Tisbury was divided into two villages, Tisbury and West Tisbury. 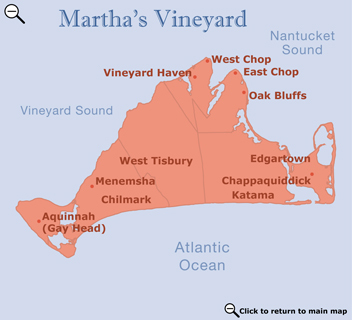 West Tisbury, Chilmark, and Aquinnah are often referred to as "up-island." Rural and unspoiled, West Tisbury has many acres of State Forest, scenic beaches, rich farmland, and many historical structures. Its New England village charm is maintained with its general store, white church, post office, and many farms. The town has maintained the neighborly sense of community for which it is noted. Twice a week from mid-June to mid-October, West Tisbury hosts the popular Farmers' Market at the old Agricultural Hall. Lambert's Cove has some lovely homes and a charming white church. Year-round and summer residents can stroll along a woodland path to the beach. The Cedar Tree Neck Nature Preserve comprises 300 acres of woodlands. Although fishing, picnics, and swimming are not allowed, there are some wonderful paths through woods and dunes and along brooks and freshwater ponds. Longpoint Wildlife Refuge comprises over 600 acres of sandy plain, marsh, woodlands, ponds, and barrier beach at Tisbury Great Pond. Swimming permitted at Long Cove Pond and South Beach.